BiocomDirect has brought together a series of Horizontal & Vertical gel units and complimentary equipment to provide a one-stop shop for life scientists. The multiSUB™ range offers the most comprehensive and versatile line of horizontal gel electrophoresis units currently available for low- and high-throughput DNA and RNA applications. 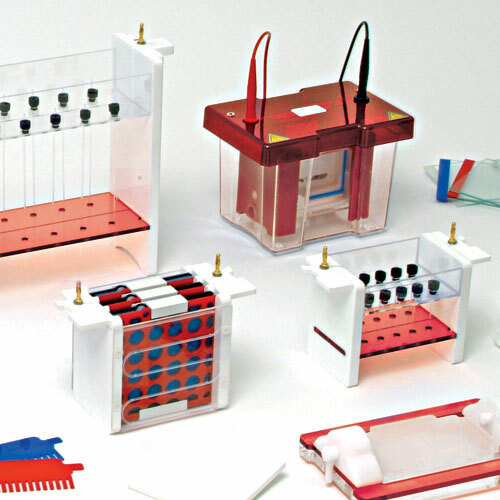 For protein and nucleic acid analysis, the omniPAGE mini, mini wide, maxi WAVE vertical electrophoresis systems – complete with tanks, inserts and reagents, fulfil a variety of applications and techniques in different gel sizes and throughputs. All omniPAGE systems comprise a modular tank design with dedicated inserts for PAGE, blotting and capillary gel isoelectric focusing (IEF). To complement the multiSUB and omniPAGE chambers, the Biocom line includes sequencing systems, blotters and power supplies to offer the widest choice of tools essential for today’s specialised DNA/RNA and protein separation applications. 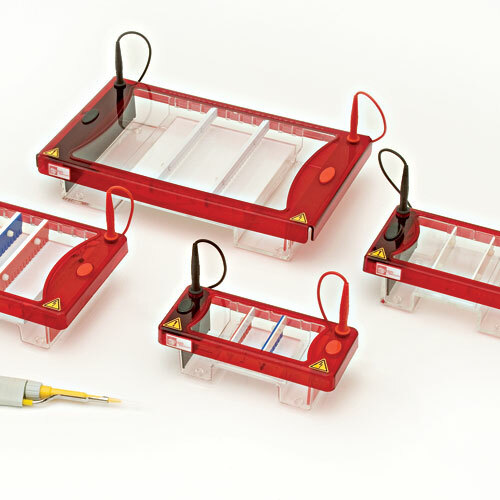 .... the multiSUB series of Horizontal Gel Units offers the most versatile solution for DNA and RNA agarose gel electrophoresis currently available. All units offer an unsurpassed combination of economy of gel and buffer volume, with gel size and sample number versatility through the option of additional gel tray sizes. For most models, easy to use, leak proof ‘plug and go’ gel casting dams are included as standard to allow gels to be rapidly cast while the multiSUB unit is in use for gel running. .... the omniPAGE range of Vertical Gel Units combines ease of use with high resolution separations. Four gel size models share a host of common features including a guaranteed leak proof seal required for trouble free, rapid and uncomplicated gel casting. The built in gel running module eliminates time consuming transfer of glass plates during casting, a process which can cause gel damage and misalignment. Glass plates with permanently bonded spacers guarantee perfect spacer alignment. .... blotting entails immobilisation of proteins or nucleic acids on a solid membrane support followed by detection using a specific antibody or probe of complementary nucleic acid sequence. This significantly increases the potential for identification and characterisation. Upon transfer to a membrane support proteins and nucleic acids become far more accessible to detection by antibodies and probes than they would otherwise be within a gel. Biocom offers options for electro, semi-dry and dot/slot blotting.